SHARON WEINBERGER is Executive Editor at Foreign Policy and the author of Imaginary Weapons: A Journey Through the Pentagon's Scientific Underworld. She is currently a fellow at the Radcliffe Institute for Advanced Study at Harvard University and a Global Fellow at the Woodrow Wilson International Center for Scholars. She has also held fellowships at MIT's Knight Science Journalism program, the International Reporting Program at Johns Hopkins Paul H. Nitze School of Advanced International Studies, and Northwestern University's Medill School of Journalism. She has written on military science and technology for Nature, BBC, Discover, Slate, Wired, and The Washington Post, among others. "Deeply researched and briskly paced." "[A] defining behind-the-scenes look at the confluence of defense politics and technological prowess. Exploring silly schemes as well as sensible ideas, distinguished military science and technology expert Weinberger profiles the crusaders who thought outside the box in service to their country and their own limitless creativity." "Her account is critical but not mocking…a well-researched contribution to the history of U.S. military technology." "They are the wizards of war, the faceless scientists who fight the battles of the future in lab coats instead of body armor, turning insects into remote control cyborgs and designing warships without crews. In her new book, Sharon Weinberger has placed one of the government’s most secret laboratories, DARPA, under an electron microscope and discovered a world far beyond anyone’s imagination." "From the Internet of today to the robots of tomorrow, DARPA has shaped not just the technology of war, but our day to day lives. 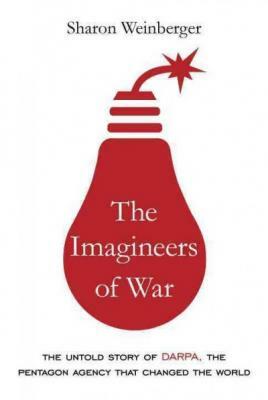 Sharon Weinberger's The Imagineers of War lays out its untold history in an easy and informative read, along the way, reshaping the way you will look at events that range from the Vietnam War to the War on Terror." "[A] fascinating and absorbing history… Weinberger’s account, based on extensive and meticulous research, reveals surprising twists in the recent history of the age-old entanglement between knowledge and power." "A deep organizational history rather than a technological chronicle. [Weinberger] scours reams of archival material and interviews former officials…revealing a highly secretive organization with a fittingly mixed legacy."